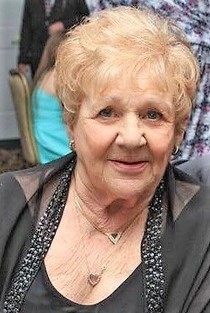 Angela M. Lombardo, 77, of Old Bridge, passed away Friday, February 8th. Angela was born and raised in Brooklyn, New York to the late Margaret and Daniel Marra. She was a medical technician for physicians in Brooklyn. After marrying, she moved her family to Old Bridge where she stayed home to raise her son. Angela enjoyed playing golf and poker. She was an excellent dancer. She and her husband were known for their Latin dancing. Angela will always be remembered as a loving mother and grandmother who always put her family first. Angela was predeceased by her beloved husband, Vincent Lombardo, in 2004. She was also predeceased by her brother, Daniel Marra, Jr. Angela is survived by her beloved son and daughter-in-law, Scott and Kimberly Lombardo of Belford along with her two granddaughters; Samantha Marra Lombardo and Alexis Joan Lombardo. Friends and relatives may pay their respects Wednesday from 2-4 & 7-9 pm and Thursday at 8:30 am at Scott & Kedz Home for Funerals, 153 Church St. Belford. A Mass of Christian Burial will be celebrated at Saint Catherine RC Church, Middletown, at 10:00 am on Thursday, February 14th. A private cremation will follow. In lieu of flowers, please consider making a donation in Angela's memory.